We definitely all learn from each other. Thanks so much again for hosting, Kristin and Eva! I agree we all have so much to learn from one another. Happy PPF! I was going to wait until tomorrow to link up, bit since my novel kept me up this late I may as well...kinda ridiculous, seeing that I've read it three times before. Anyway, I'll be putting an interview together for you soon - I had been intending to, but my pregnancy has slowed down my blogging. Amen! !I have learned something from each and everyone of you! Amen!!! I have learned from everyone one of PPF artists! 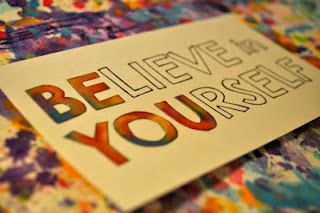 I love how in 'Believe in you'it came out BE YOU...As Oprah used to say.. Everyone has a story. Happy PPF. YES! Everyone has a story worthy of being told. I look forward to hearing more of them. Telling my story here got me back to painting again. Who knows what it will do for you?? Still on double shift at work.... sorry for not commenting too much, but I get home late in the night. Yes, thanks for the encouragement! So many wonderful artists here. My art left the canvas again today. Happy PPF everyone! Thank you for such a lovely affirmation to each of us - we can all learn from each other and I certainly have learnt about so many different techniques from the folk I've met at this wonderful party! Yes! Wonderful message! We all feel inadequate sometimes but their is so much to share and learn from each other. Yes, come on - submit! I love to read them all every week. There's so much talent out there, everyone has their unique style and take on life and we want to know more about you!! I will think about it! I really like the graphic you made for today. I love reading these! Thanks so much for posting them and looking forward to reading more! I also like the graphic you created. Every eye sees something differently....I love the variety in art..it's as varied as the people God created. 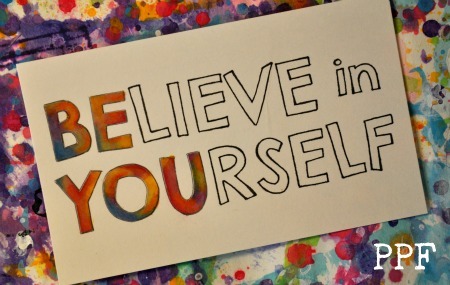 Yes believe in yourself. Such a lovely message. I was brave today and linked up for the first time. I've been following Tracey Fletcher King for awhile now and she inspired me. This is a very positive place, i really like it here. Would you would please resend it? We would love to be able to share it! Hi Eva and Kristin and everyone. I miss PPF, but I'll be back next week. What a wonderful message for everyone really. I know that being a member of PPF since it began has really opened doors for me in many ways. I say, Hip Hip Hooray!! Three times. tee hee. Be back next week. Now it's time to go finish up my duties. I have a lot of catching up to do next week. Part of Colors of Summer2 - a strawberry lemonade doodle fish - love to doodle! Hi! I have been out of action for a little while. Great to be back and finally check out PPF again! Been a lurker for a while. Great message and thanks for hosting! I love the sign. Perfect! Thanks for the reminder. That is why this is a great site, so much variety! I think it is wonderful to read and look at each others work and learn from each other. We are all so different coming from different culture, in different age and we have been practicing some for many years and some for few. So please tell your story, we all enjoy. I promise to tell my story next time. But I am enjoying looking at everyone's work. What a talented community! what a great message. and i love that you have created this wonderful, friendly forum for people to meet, share and get to know each other! thank you! Hello Eva and Kristin, yes maybe one of these days I'll submit, but for now it's already great to participate in this paint party, thanks so very much and enjoy your week-end! We searched our emails for your message, but couldn't find it - I am starting to worry that emails are getting lost. Please know that you are definitely NOT a "terrible artist", and we would LOVE to have you submit your interview! Thank you for speaking to the artists like myself. I love the picture you have posted too. thank you for the message and for hosting this party! Thank you for hosting this - I love seeing everyone's work. I'm sorry I posted twice to Mr. Linky but the first one had a link to last week's painting so I apologize for any confusion. I love your blog, because it motivates me to paint. It's also a marvelous place to see what other artists are doing worldwide. I'd like to submit an interview, but haven't gotten around to it with everything else I have going on. I'll try and do it next week. Blessings! Thanks for hosting! I've been missing being a part of PPF! I would love to be a featured artist! Thanks! thanks so much for your blog and all the motivation. I love seeing everyone's work! Thank you for the challenge and this blog. Arriving late to the party, but better late than never!